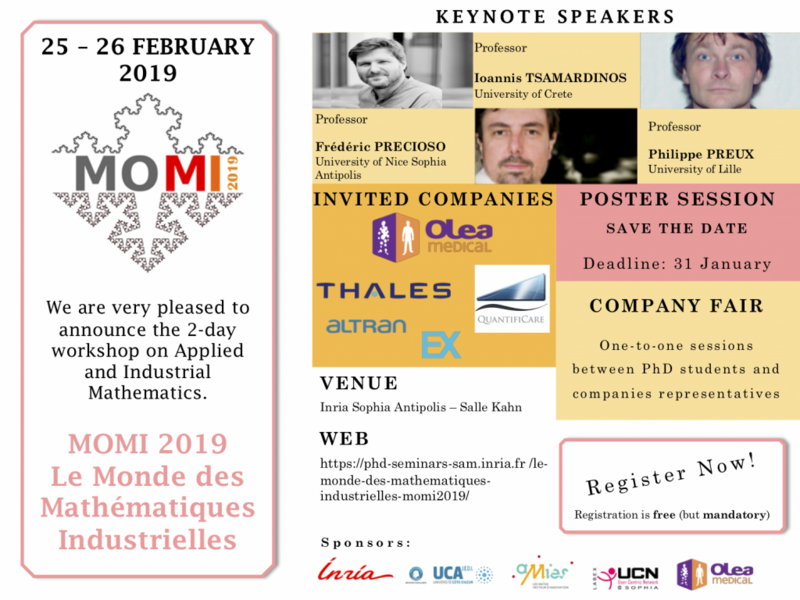 We are very pleased to announce the 2-day workshop on Applied Mathematics, MOMI2019, which will be held on February 25 and 26, 2019 in Salle Kahn, Inria Sophia Antipolis-Mediteranée. The focus of this year’s edition will be on Big data and Machine learning. Three keynote speakers will provide insight into the aforementioned subjects and representatives from local industries will share their experiences on the “real world” mathematical problems that they deal with. A poster session will be held on the first day, for which we strongly encourage you to send your poster. And this year, we will be closing our workshop with a company fair, where PhD students can directly interact with companies representatives. Looking forward to seeing you at MOMI2019!